The following maps and images of the Mount Sinai site help show where each component is located. These maps show parts of northwestern Saudi Arabia, with the Red Sea’s Gulf of Aqaba to the west. Below maps of the mountain’s location are additional maps detailing the boundaries of Midian and Egypt. The image below shows how the sites allegedly matching the Exodus story are clustered together. Jabal Maqla, the favored candidate for Mount Sinai/Horeb, is the mountain with a black top. To the northwest of Maqla, there is a marker locating the distinctive split rock that may be the “Rock of Horeb” in/near the Rephidim encampment (which is where the Israelites fought the Amalekites). To the northeast of Jabal Maqla, one can see where an ancient, pre-Islamic burial site is located. It is away from the Holy Precinct near the mountain and outside of the plain where the Israelites would have camped. It is also off the path that the Israelites would travel through. Its placement makes it a match for the burial ground for the worshipers of the Golden Calf. Directly to the east of the mountain, you can see where the possible Altar of Moses is located, at the foot of the mountain. The possible Cave of Elijah is almost directly above it. Further to the east (behind the Altar of Moses) is the archaeological site that may have been where the worship of the Golden Calf took place. The above image shows three possible routes to Jabal Maqla/Mount Sinai if the Red Sea Crossing happened at Egypt’s Nuweiba Beach. The route is dependent upon the significance of Magna, where there is a strong tradition that Moses and the Israelites camped, possibly after stopping at Elim. Image courtesy of DiscoveredSinai.com, a partner website. This map details what we believe is the most plausible route by which the Israelites traveled out of Egypt into Midian and then to Mount Sinai. As mentioned in our section discussing the Red Sea Crossing, some scholars advocate for an alternative location further south at the Straits of Tiran. The number 3 marker identifies where Jabal Maqla is located, with the peninsula-shaped plain in front of it. The route to Nuweiba Beach, as theorized by Dr. Glen Fritz. Image courtesy of Glen Fritz, The Lost Sea of the Exodus. Another view of the route from Egypt to Midian, with the Biblical places identified by name, according to Dr. Glen Fritz’s research. Image courtesy of Glen Fritz. This image shows Nuweiba Beach and how it fits the descriptions of the Red Sea Crossing site from the book of Exodus and non-Biblical sources like Josephus. Here, the Israelites would be surrounded with mountains on three sides and the Red Sea’s Gulf of Aqaba in front of them. Image courtesy of Glen Fritz. A rough depiction of the underwater path that stretches from Nuweiba Beach to the Saudi shore with a gentle slope and steep sides. Image courtesy of Glen Fritz. One important point in discovering the true location of Mount Sinai is to identify boundaries between ancient empires and lands. The Bible states in no uncertain terms that Moses went out of Egypt into Midian, so he could not have been within lands controlled by the ancient Egyptian empire. Below are several maps of the region that show where ancient Egypt and Midian were located. In the above map, the Sinai Peninsula is included as a part of ancient Egypt. St. Catherine’s mountain, the traditional location, is located in the southern part of this peninsula. If Moses brought the Israelites out of Egypt, he would not have stopped in territory that was under Egyptian control. Dr. Allen Kerkeslager, in his scholarly study of Jewish Pilgrimages, noted that during the Late Bronze Age, the Egyptians did control the Peninsula, and would have had troops to guard their interests. The southern Sinai peninsula was quite simply not in Midianite territory. The boundaries of Midianite territory were just slightly southwest of modern Eilat on the extreme northwestern shore of the Gulf of Aqaba. Allen Kerkeslager, “Jewish Pilgrimage and Jewish Identity in Hellenistic and Early Roman Egypt,” in Pilgrimage and Holy Space in Late Antique Egypt, ed. David Frankfurter (Leiden: Koninklijke Brill, 1998), 151 (footnote 215). Given this historical fact, it would not make sense for the Hebrews to flee to the Sinai Peninsula away from the Egyptians when the Egyptians controlled this very territory and had troops garrisoned in the region. Indeed, the Scripture indicates dozens of times that the people went out of Egypt, and into another land (Exodus 3:8, 10-12; 6:11, 13, 26; 7:5; 12:17, 39, 42; 13:8-9, 14, 16, 18, among a host of other passages throughout the Pentateuch, Old Testament, and New Testament). With these pieces of information in mind, it becomes nearly impossible to then justify the traditional site for Mount Sinai. The Israelites simply must have crossed into Midian at the Red Sea, and not into another portion of existing territory. On the other side of the Gulf of Aqaba (or Yam Suph in ancient Hebrew) is Midian. The two most plausible theories for how the Israelites crossed into Midian are the Straits of Tiran and Nuewiba Beach options. 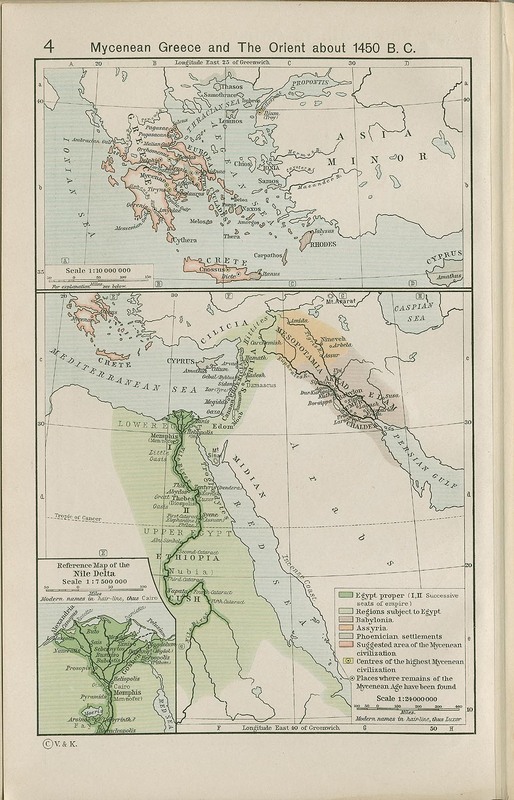 In this map below, “Mycenean Greece and The Orient,” drawn by William R. Shepherd in 1911, he shows that the ancient Egyptian realm in 1450 B.C. encompassed the Sinai Peninsula, and Midian was on the east side of the Gulf of Aqaba. He included Mt. Sinai on the Peninsula in this map, so it is uncertain if he considered the territorial problem with this theorized location. Shepherd, William. Historical Atlas. New York: Henry Holt and Company, 1911. 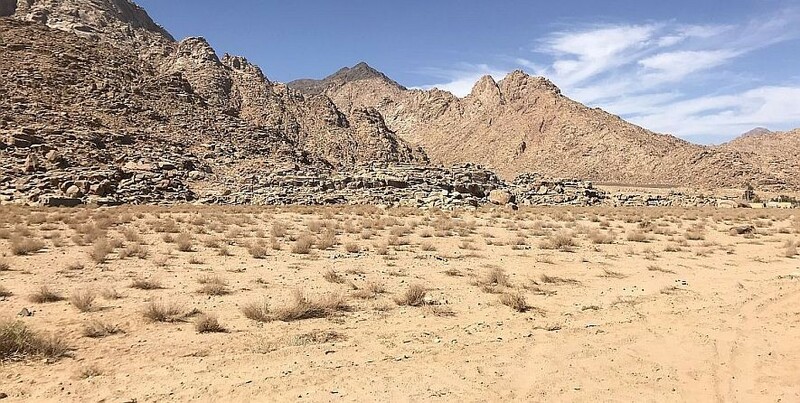 In spite of the historical fact that the Sinai Peninsula was technically under Egyptian control at this time, some historians and archaeologists still insist on the traditional location. The line of reasoning is frequently similar among these proponents, as Joel Richardson explains in his book Mount Sinai in Arabia: The True Location Revealed. First, they claim that the common understanding of the term “Arabia” in Paul’s day would have included the Sinai Peninsula. We agree with this. From there, however, without any basis to do so, they simply say that this is where Paul must have been referring. One example of this is Dr. James Hoffmeier’s assertion that the term “Arabia” included the Egyptian Sinai Peninsula in Greco-Roman times. However, Hoffmeier asserts that because this region was included, when Paul referred to Arabia in Galatians 4:25, he was referring specifically to the Peninsula and nowhere else. One Egyptologist, David Rohl, states plainly that the assertion Paul was referring to anywhere but the Peninsula is “complete nonsense” in his book Exodus: Myth or History? Gordon Franz, advocate for Jebel Sin Bishar in the Western Sinai Peninsula, has the following to say about the map identification of Arabia. The Galatians 4:25 reference might indeed support the view that Mount Sinai was in Saudi Arabia if the Apostle Paul was looking at a 1990 Rand McNally Atlas. However, it would not be true if he was looking at a First Century AD Roman road map. Gordon Franz, “Is Mt. Sinai in Saudi Arabia?” Bible and Spade, Fall 2000. The problem with Franz’s objection is that Greco-Roman maps did not identify the land that is now Saudi Arabia as such, and obviously so. Though the names of these regions have changed over time, the landscape itself has not. In Paul’s day, the term “Arabia” may have been used in a variety of ways, but it certainly wasn’t limited solely to the Sinai Peninsula, a region that many ancient cartographers did not fully understand, as many old maps do not show both the Gulfs of Suez and Aqaba, including several of the ones towards the bottom of this page. The following map from 17th Century English cartographer John Speed shows the Red Sea as almost one continuous body of water, rather than one that splits into the two gulfs, forming the Sinai Peninsula. The Peninsula can roughly be seen from his drawing, but the gulfs hardly exist according to maps from several centuries ago. Even among the Greco- Roman geographers, unqualified references to Arabia would most likely point to the Arabian Peninsula. In the fifth century BC, the Greek historian Herodotus used the term “Arabia” to identify the Arabian Peninsula. In fairness, however, as we have discussed elsewhere, even though Herodotus was not aware that the Sinai Peninsula even existed, he still would have viewed it to be part of Arabia. Consider a simple analogy. Imagine that I said, “God Bless America.” No one living today would understand me to be referring to Canada, Costa Rica, or Brazil. Technically however, these are all parts of North, Central, or South America. It is true that the region of Arabia, as the Greco-Romans understood it, could certainly have included the Sinai Peninsula, but it’s not likely that Arabia was the exclusive name for the Peninsula. Several maps from centuries past have identified Mount Sinai/Horeb as being in what is likely Saudi Arabia. The ancient cartographers, who lacked our modern technology, tended to omit the Gulf of Aqaba from their maps of the region because they could not identify it in relation to the rest of the land and sea. In spite of this lack of knowledge, the cartographers did appear to place Mount Sinai and Midian far enough east to be located not in the Sinai Peninsula, but the Arabian Peninsula. To the southeast of Mont Oreb, there is also a city labeled as “Madian.” This alternate spelling of Midian indicates that Sinai/Oreb (Horeb) in the surrounding area, and because Midian was mostly or entirely in modern day Saudi Arabia, is can be inferred that Mount Sinai may not have been in the Sinai Peninsula as the traditional theory maintains. Image obtained via Library of Congress archives. About three decades later in 1682, Dutch cartographer Frederick de Wit also drew a map of the Arabian Peninsula and identified Madian, Horeb M., and Sinai M. on his map. 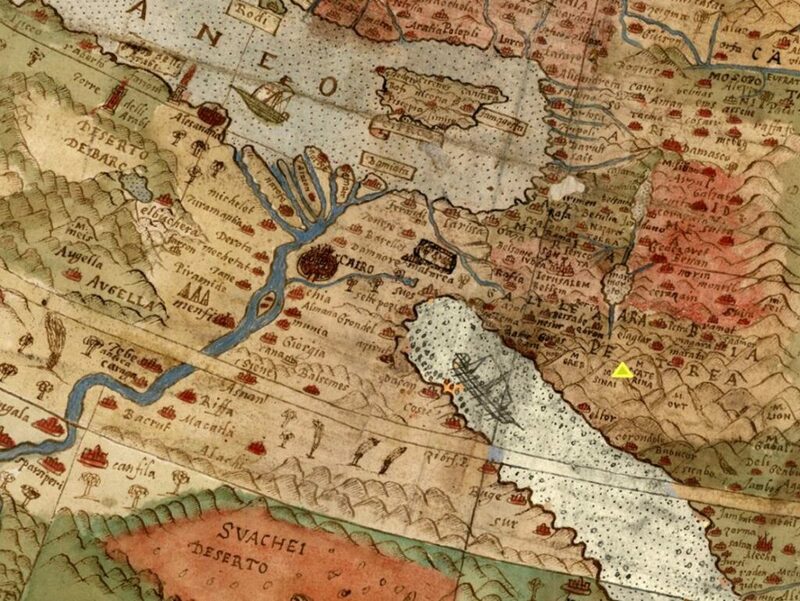 Another Middle East map listing Mount Sinai is from Urbano Monte in 1587. This map, like the ones shown above, do not show the Gulf of Aqaba in its portrayal of the region. Sinai is marked by a yellow triangle on the right side. Image courtesy of Joel Richardson. Page last updated March 28, 2019. To the northwest of Maqla, there is a marker locating the distinctive split rock that may be the “Rock of Horeb” in/near the Rephidim encampment (which is where the Israelites fought the Hebrews). Also, please pass along to the experts that the possible route was initially directly from Goshen to somewhere near what is now Gaza. This is the probable reason why Pharaoh did not pursue them as the effort would have been wasted since the Israelites could enter Canaan before his army could reach them. They abruptly turned South to the location indicated by Mr. Fritz and is the reason why they were then pursued. (Ex 14:3) This, however, is just conjecture on my part. Nevertheless, please consider it among the possibilities. Excellent website. Absolutely excellent. Thank you! Yes, we will fix that. Thank you for your thoughts on the circumstances surrounding the Exodus story. It is fascinating to review all of these details to understand their contexts. The well-known trade route from Egypt to Midian would not have led the Israelites into Gaza (the land of the Phillistines) as it was just south of that area. Question: are we analyzing the crossing using current data, but not taking into consideration the landscape from 3500 years ago? For example, the width of the Red Sea is quite wide, but I wonder if 3500 years ago it may have been more narrow giving plausible rise to the notion that a strong, easterly wind (driven by Divine hand) could have caused a narrow passage to emerge, allowing the Israelites a means to cross the sea with ease? Landscapes change over time, and we are analyzing the sea crossing using current topographical models. Is it possible to assume that the width of the Red Sea was more narrow 3500 years ago? It’s possible, but I’ve been told that the changes would be minimal. We are looking for more analysis of that. In “The Lost Sea of the Exodus,” Dr. Fritz points out that the Hebrew word usage indicates that the strong easterly wind is not the only weather phenomenon responsible for the waters parting, and other verses like Psalm 114:3-5 indicate seismic activity accompanied it. The strong easterly wind, as the Exodus story claims, could have dried the path. The historian Josephus also describes a very dramatic storm. I would expect that the force of the water after crashing back into place would have lowered the underwater bridge on which the Israelites had crossed. It makes me think of the Mt St Helens eruption and the force of the water being thrown from Spirit Lake onto the mountains and washing all of the trees down into the lake. The force of this water falling back into place I can’t see not dropping down the path to some extent of what it may have been when they crossed. There still exist a road in 2 to 4 m (13 ft) water quite close (about 200 m – 220 yard) to the present coast between Venice and Grado in the north Adriatic. This road is estimated to exist at least since the Hallstatt period (1’200 bc). There are also piers in Istria from the same period, which are covered by 5 m (16 ft) of water where I used to dive as teenager. This could indicate that the sea was exposing land-strips in the Gulf of Aqaba, which are nowadays covered by at least 6 m (20 ft) of water. I don’t have the marine charts with bathymetric lines of that region but would be pleased if somebody can check that in the straits of Tiran, which might be a more logical path. I’m reading this site with the highest interest. My compliments. Just received the original Admiralty map of the Tiran area and the whole Gulf of Aqaba. My money is on Tiran crossing. The seismic data suggest that the two narrow passages, where Moises definitely couldn’t cross are from about 2’000 to 600 years ago. That may be confirmed by scientific research, which wasn’t permitted in the past years. The Island of the Baal cult is completely wiped of every construction. This may indicate a huge earthquake and/or tsunami wave. If either Nuweiba Beach or Tiran or any location on the Gulf of Aqcaba is the crossing, then Siani would have to be east of Aqcaba? Another question: If the traditional Siani site is assumed, then where could have the crossing occurred? These questions seem to put the traditional site into question without having to know where the mount is.